Major renovations in Elgin’s swimming pool could begin as soon as August 2016. 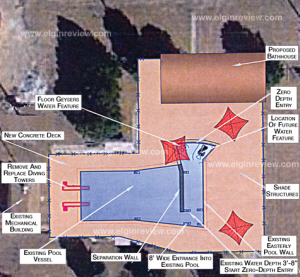 That and other information about renovating the pool were presented to the Elgin City Council at a special meeting last week. On Thursday night, Mayor Mike Schmitt and council members heard from several individuals about proposals to improve the public swimming pool which was built in 1959/60. A formal kickoff of the capital campaign will begin in the next 3-4 weeks, according to members of the local pool committee consisting of Todd Heithoff, Bethany Miller and Michael Moser who attended Thursday night’s meeting along with David Burbach, director of Aquatic Services for Burbach Aquatics, Inc., based out of Platteville, Wis.
Moser said the consensus of committee members was to recommend to the council to renovate of the existing main pool vessel and add a new zero depth entry point. Also, the recommendation calls for a new replacement bathhouse to make it ADA compliant. Estimated cost for the pool renovations would be approximately $1.5 million with another $50,000 in alternatives which would be determined through fundraising efforts. Considerable discussion was spent on how to fund the pool renovations. Committee members said funds would be raised from a combination of a major capital campaign and municipal bonds. A contribution has been made which would amount to one-third of the estimated project costs. Municipal bonds could provide another one-third with the remainder to come from the capital campaign. Heithoff said there are grant funds available to assist with the renovations. However, he added, most of the grants are contingent upon a large portion of the funds being raised before they will be awarded. Provided the necessary funds can be raised, the tentative start date for beginning construction would be on or about August 1, 2016 with the pool to be used during the summer of 2017. The pool committee was authorized to continue to be proactive throughout the building of the new facility until it is turnkey ready. Council-man Mike Dvorak asked Burbach how much more it would cost to build a brand new pool with a 50-year life expectancy. Burbach said it would be an additional $800,000 to $850,000. The consensus of the council was this project needs to be done. “We’re going to have to go forward,” Councilman Don Mackel said. Dvorak added his thoughts, “If we’re gonna have a pool, we have to do it.” Councilman Duane Miller made the motion to proceed, Jim Kittelson seconded the motion. Near the conclusion of the meeting, the council thanked the pool committee members for their commitment and support for the pool project. Other committee members are Sue Vanis, Mayor Schmitt, Duane and Vicki Miller. Early in 2015, Burbach Aquatics, Inc., submitted a report regarding an evaluation made in 2014 of the pool. The evaluation was to inventory the existing condition of the pool and building and to recommend necessary improvements to restore the facility to good repair and/or meet significant code requirements of the Nebraska Department of Public Health, Division of Environmental Health, Swimming Pool and Spa Program and the Americans With Disabilities Act. The report based its recommendations on a 25-year project renovation life.